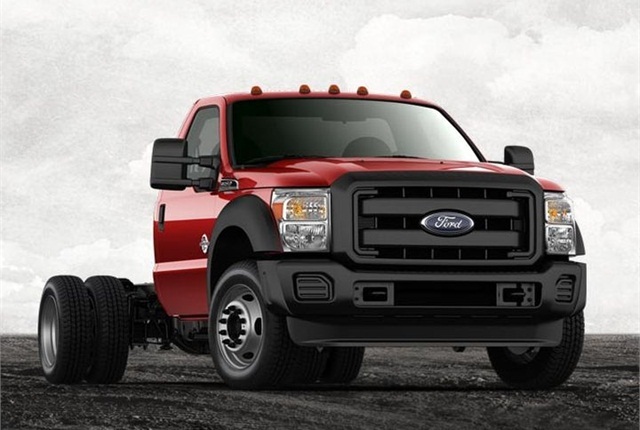 Photo of F-450 Super Duty chassis cab courtesy of Ford. Commercial and government fleets added 350,837 trucks in classes 3-8 through the first half of 2015 for a 12.1 percent increase from the comparable period a year ago, according to IHS Automotive's second quarter commercial vehicle report. The increase marks a steady upward trend that began in 2009 for the January-to-June period. This year's first-half registrations marked the fourth strongest period since 2000. Large fleets with at least 501 vehicles are driving growth among Class 8 registrations with a 20.2 percent increase from a year ago, and registrations of Class 7 and Class 3 vehicles have also showed strength with increases of 11.4 percent and 9.7 percent respectively. The report forecasts full-year commercial registrations at 696,200 vehicles in classes 3-8 for a 5.4 percent increase form 2014. After Class 8, Class 6 would show the strongest growth trajectory of 5.9 percent with about 51,900 units. Class 5 registrations are projected to fall 5.1 percent to about 58,000 units. Fleets are adding new trucks more frequently than used trucks even though the two categories make up nearly equal market share. New trucks saw an 11.2 percent increase, while used truck registrations fell 5.4 percent. Among new-truck brands, Ford saw the highest number of fleet registrations in the first half of 2015 with 94,682 followed by Freightliner with 68,817. As far as engines, diesel remained a strong favorite over gasoline with 77.6 percent share. Registrations of trucks with factory-installed natural gas engines have declined 16.8 percent. The full report is available to NTEA members by clicking here.